Online Mustard shopping goes square. 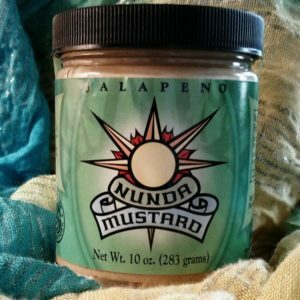 New Online Store featuring Nunda Mustards and Ketchups is now LIVE. Our store is hosted by the popular charge card reader called SQUARE. We are Still working out some kinks like adding paypal, check, or money order options, but alas it will in due time. We need to say good bye to our partnership with the Abbey of the Genesee and were truly blessed and thankful for the wonderful shipping services they provided us for the past 3 years. Shortly after our production facility moved to Mt. Morris, NY we introduced ourself to the community at our Grand Opening and then we opened our doors to Norma Holland and her Camera Operator of Wham 13 and Fox Rochester. Nunda Mustard and Monk’s Bread (Shipping or Sandwich) you choose! 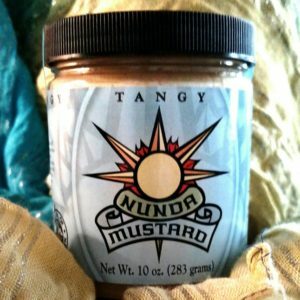 Starting December 2012 a switch has occured with the online sales of Nunda Mustard. We have linked our online sales to Monk’s Bread as to improve our customer service. They will offer several multi jar specials and shipping options. You will be redirected to their site for the shopping option. Our site will continue to offer you Retail locations, Regional Festivals, Recipes, Contact Info and a Brochure. OR How about a grilled Swiss Cheese sandwich with Smokey-Maple Nunda Mustard on Monk’s Sunflower with Rolled oats Bread …. Now that you read this far, you have to choose ! 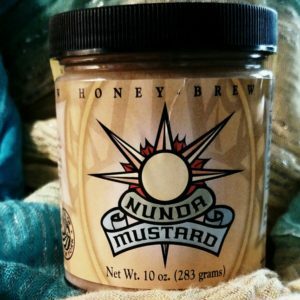 Nunda Mustard at local Farm Markets! 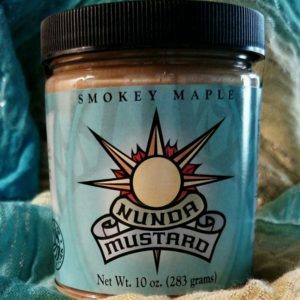 Local Farmers Markets are quickly becoming a trendy and economical way to shop and Nunda Mustard is available at many farmers markets. With so many farmers markets in many locales, we would be pleased to discuss adding our products to stands at other farmers markets within our region. Please drop us an email if interested in adding our line to your offerings. Nunda Mustard in 13WHAM Mt. Morris commercial! 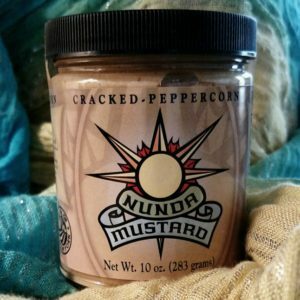 Nunda Mustard is one of several merchants featured in 13WHAM -TV’ s Mt. Morris commercial. Visit the beautiful newly renovated Mt. Morris downtown area and nearby natural wonder of Letchworth Park. And of course, visit Mt. 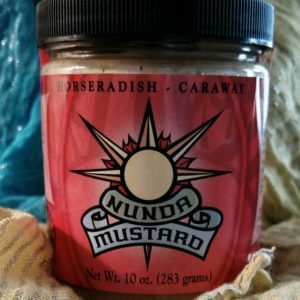 Morris’ great restaurants and shops, and get some Nunda Mustard! You’ve tried it on pretzels but have you tried it off the menu …? 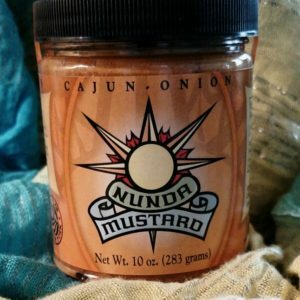 We have been selling Nunda Mustard in the glass 10 ounce size at festivals and in stores for 13 years, but rarely make mention of all the Local Resturants that purchase it by the Gallon for use in their menu items. 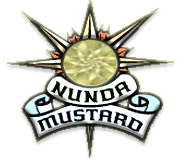 Soon there will be a page dedicated to places you can go that serve or incorporate Nunda Mustard in their menu. 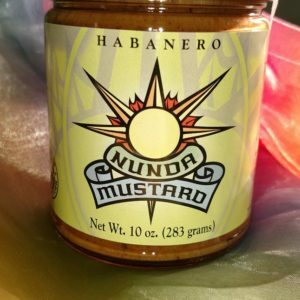 Nunda Mustard is featured in a video wrap-up for Savor Rochester 2010! Proceeds of the event benefit Foodlink. Savor Rochester is held annually at Rochester, NY’s historic Public Market. Great food, Great place, Great cause! 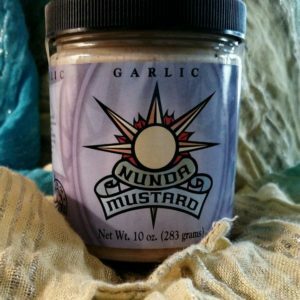 Mustards are now available in gallon, half gallon, and squeeze bottles! Don’t forget to check out Nunda Mustard at the Park Avenue Fest and many other excellent festivals in 2011!